It’s February and it’s time to start back practising golf. I am suggesting a lighter gradual approach to practice rather than spending a lot of range time practising. Our goal is to avoid developing bad swing habits or making bad swing habits worse! The outline practice plan is not to practice too much golf too soon but increase your practice times gradually. You could use the following practice plan as a template. Hit ten shots with the best possible golf swings you could possibly make with a 7 iron. Note the number the number of shots you have hit off the sweet spot in a practice diary. You can change the goals if you like and add “aim” and estimate how close the ball lands near the target. What is your success rate out of 10? On shot 3 & shot 6 practice your pre-shot routine. For example, use your mind to imagine the golf shot you are going to play, make a really good practice swing that will hit that shot, set up and hit that shot. Check your setup that (aim the club head, align your feet, hips & shoulders to the ball to target line, check your ball position with the club you are using is in the correct position. Develop your swing by repeating the same good feeling swings as much as possible. How? Make the best practice swing you can make and then repeat the same swing hitting a shot. Practice hitting 6 shots practising your ½ swing drills then 6 shots practising your full swing technique. Vary your club selection, use 8 iron, 6 iron, 4 iron or 9 iron, 7 iron and 5 iron. Use the ten ball test again and note your results in your practice diary. You might spend about 45 minutes to an hour hitting 50 balls to this suggested practice plan. It would great to visit the driving range twice or three times to work on this plan. Map out your progress and plot your progress after three weeks of practice. Try this and let me know how it works for you. 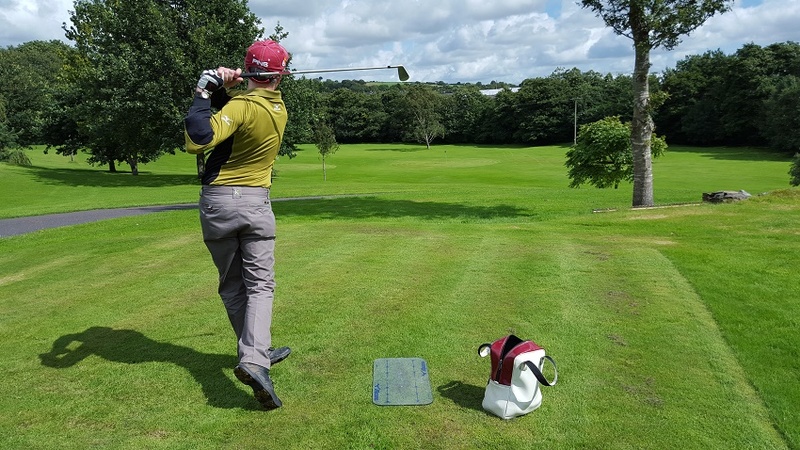 Enjoy your golf lessons in Cork and click here to contact us to start playing better golf today. Should you arrange a Golf Club custom fitting?